In 2012, Urban Decay completely revamped and reformulated their already extremely popular eyeshadow line in attempts to develop something with better adhesion to reduce fallout, a finer and silkier texture, and to be as crease resistant as possible. Not only did Urban Decay succeed in doing so, they also completely changed their packaging. Once clear plastic boxes, are now colorful and more green-friendly cardboard boxes. Urban Decay even went a step further to make customizing your eyeshadow collection even easier by modeling their shadows to pop out of each single coin style, into collective eyeshadow pans. All but one build-a-palette, up to current date, comes with a limited edition shade only available in those select palettes. With their reformulation, UD added new single shades that were previously only available in their old palette collections (approx. half of the new collection), in the process, they also phased out some of their other shades. However, the new line is available in five fantastic finishes: Satin, Shimmer, Sparkle, Duotone and Matte! 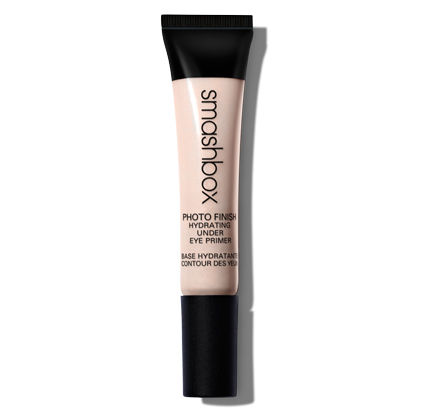 Smashbox Photo Finish Hydrating Under Eye Primer is Smashbox’s first primer dedicated to treating the sensitive skin under your eyes! It provides 10 amazing benefits for your eyes including; (1) Hydration, (2) dark circles, (3) puffiness, (4) radiance, (5) fine lines and wrinkles, (6) texture, (7) skin tone, (8) age spots, (9) clarity, and (10) soothing, PLUS it’s a great primer!